This is a simple and delicious way to enjoy leftover barbecue brisket. 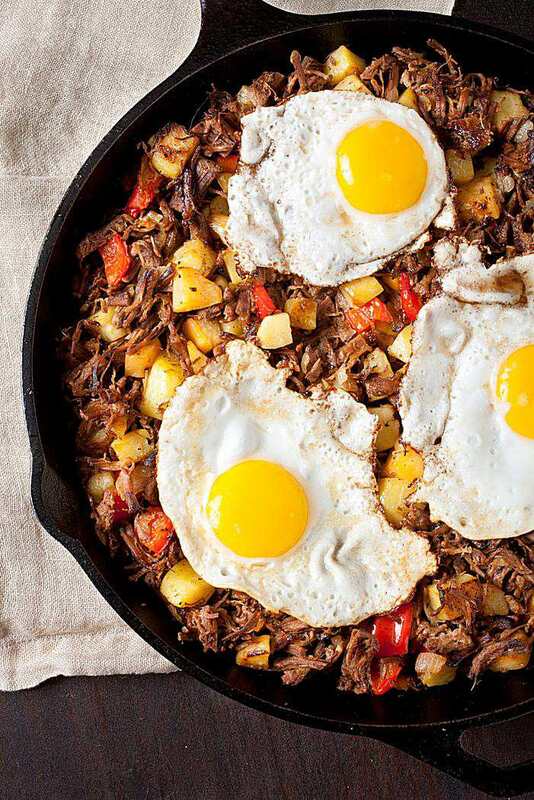 The best part about this hash is that it doesn't need to be a breakfast of brunch item, but can be served for dinner. A quick, easy, meatlovers treat. Cook onions over medium heat for 3 minutes, until translucent. Add garlic, and diced red pepper. Add potatoes and cook for 15 minutes, flipping with a flat spatula every few minutes so all ingredients brown evenly. Dice or shred brisket into small pieces. Remove any excess fat from meat and add to pan with potatoes, garlic, and peppers. Season with salt and black pepper and cook for an additional 5-7 minutes until beef has browned and potatoes are tender. Cook eggs to preference, though I recommend over easy or over medium for this recipe. However, scrambled, poached, or well-done eggs work well too. Double the amount of eggs called for in the recipe if you wish to serve 2 eggs per person. If you'd like to add barbecue sauce, simply warm in ​a microwave for 30 seconds to 1 minute and stir. To plate, add 4-5 equal sized portions of hash onto plate, spoon on ​the desired amount of barbecue sauce and top with cooked eggs and serve.